L.E.D. or Glow Performances are also available for indoor shows, clubs, and venues where fire is not permitted. Beautiful shimmering flags and L.E.D. 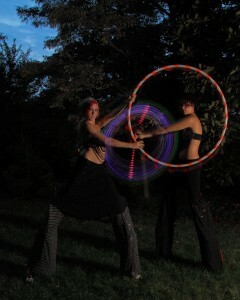 poi are spun rhythmically, creating mezmorizing light shows while L.E.D. hoop dancing entrances audiences! Can be combined with elaborate costuming and stilting for a real spectacle!